East Bank Pointe Subdivision is a new 51 house subdivision being built in Alorton, Illinois. Due to the high water table from the nearby wetlands, this entire project was designed using a pressure sewer system with individual grinder pump stations. Unstable soils issues required additional soil preparation under footings to provide adequate soil bearing capacity. Soil conditions also required placement of lime modified soils. The subdivision is located adjacent to an identified wetlands area requiring special care to protect and maintain wetlands flora and fauna. Our services included all preliminary planning, surveying, and civil design engineering, as well as construction observation, and construction management. 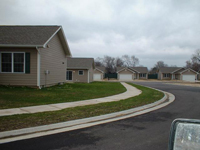 A street view of the subdivision. The grass hasn't quite grown in here. Copyright © 2010 Curl & Associates, Inc.